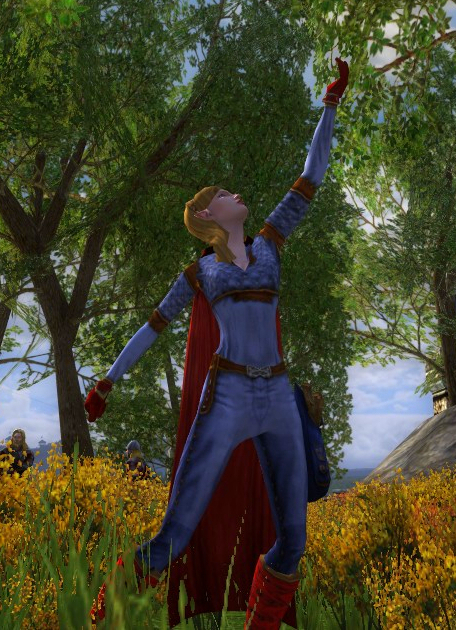 Supergirl of Lorien: Happy 6th Anniversary, lotro! But… the Anniversary party starts today and I decided to take the day off. Keep an eye out for CSTM’s Anniversary post! Time to fly! If you need more to see today, visit last Anniversary’s article at happy-5th-anniversary-lotro. p.s. Dana, remember to correct the Steed of the Champion basic horse picture because she is not a natural blonde sorrel. already on my way to a anniversary mount :) planning on picking both up and praying for some envelope drops! It looks like only the possibility of a WS cosmetic via envelopes awaits me in the yet-to-do list for this year. Will still make a fun time of it (hopefully, lol). Once again, my dear RK elf, Wrynne, is most grateful for all of your help. Please when time allows, share your insights on RK skills, esp how they interact. I just discovered that Essay of Fire allows instant casting of other skills. Sweet. It's good to learn more and more. Essay of Fire has gone through some transformations over the past year, but you are indeed correct that it gets one free skill induction following it... Essence of Flame (big hit, normally has induction of 2s) is a good followup.